CLV > Blog > Which Prom Dress Would Your Style Icon Wear? Which Prom Dress Would Your Style Icon Wear? Celebrity style icons; we all have them. Maybe it’s Hailey Baldwin’s girly-meets glam aesthetic or the way Zendaya can step into any article of clothing and own it. The point is, when it comes to that lady on a red carpet, our eyes are fixed on her, and only her. And with prom nearing, your fave style icons can be major inspo for wow-ing the paparazzi (or, you know, mom with her iPhone) Scroll below for our predictions on which prom dress 5 style stars would wear to formal this year. This petite songstress loves to rule the stage in form-fitting ensembles that show off her figure, so we could totally picture her in this sleek black prom dress! Spaghetti straps, sheer lattice beading, and a thigh-high leg slit? So Ari. You’re welcome, next. Whether it’s a fun prints, thigh-high leg slits, or bold hues (or all three!) Zendaya likes to keep us guessing every time she hits the red carpet. A true trendsetter, you’ll never know what she’ll step out in next…which is why this yellow prom dress totally suits her. The unexpected hue is set to be super popular for Spring, and the floral detailing is simply gorg. This top model loves to put a glamourous spin on super feminine style. From ruffles to beading to flowing silhouettes, she’s donned it all on the red carpet. With its ruffled cold shoulder neckline and shiny floral detailing, the new Mrs. Bieber would def strike a pose in this soft blue prom dress. With her jet black hair and creamy complexion, Camila sizzles in red, so it’s no surprise that she’s rocked the color at several high-profile events. Mirror the singer’s style in this spaghetti strap prom dresses bearing a flirty double leg slit. The dance floor will Never Be the Same. Reality superstar? Check. Makeup maven? Check. Total trendsetter? Check. Kylie knows exactly how to dress for her curvy frame, and honestly, this charcoal slip dress has KJ written all over it: dark, formfitting, and showing just the right amount of skin. More red carpet-worthy prom dresses? Uh, yes please! Shop the full collection here. 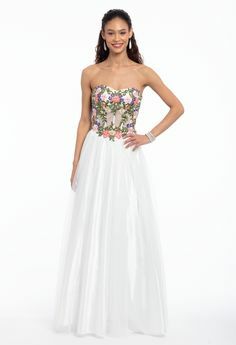 January 25, 2019 by Camille La Vie | Comments Off on Which Prom Dress Would Your Style Icon Wear?